Budgeting: why bother? I find budgeting to be a chore and would much rather focus my limited time for my finances on increasing my income and investing. We only have 168 hours in a week, 112 of which are spent awake if you get 8 hours of sleep. I like to maximize those 112 useful hours. In the broadest sense, a budget is just a plan for your money. If you are paid regularly like most military employees, you should have at least a basic plan for your dollars that arrive every 1st and 15th of the month. I set up my finances to invest automatically first and then not worry too much about what’s left over. It is amazing how fast your net worth grows when you automate your investments into the TSP and your Vanguard IRAs. Paula Pant describes a simple budget on her blog called the “Anti-Budget.” It’s similar to how I budget my own money. Here’s the gist of it: automatically pay down debt, save a bit, and invest some. Then spend the rest on whatever you want. I like to differentiate between saving and investing. Saving to me is setting aside money to be spent later, within the next week, month, or year. You should save a bit of every paycheck for the large annual or monthly expenses you know are coming: car maintenance, rent, mortgage payment, auto and renter’s insurance, cell phone plans, utilities, and Christmas. If you want a nice vacation to Argentina or Austin, put aside some money each month to cover your airfare, hotel, and expenses. This is savings to be spent, not savings for financial independence. Investing is savings set aside for retirement or financial independence. This is money I will not touch for decades, or possibly ever. This is my stash of cash that sits in my TSP, Vanguard IRAs, and Betterment taxable account. Invested automatically in accordance with my asset allocation plan in simple, low cost, and diversified passive index funds, I expect this money to double roughly every 10 years. When personal finance people discuss “savings rate,” I believe they are usually referring to “investment rate,” or the percentage of my income that they allocate towards long term investments. Savings rate, therefore, is a bit of a misnomer. Who cares if you save 100% of your income in one month only to spend it all the next? It’s important to differentiate between saving to spend and saving for financial freedom. 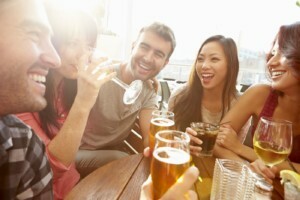 I keep things simple: invest 50% of my income and spend the rest on the things and activities that make me, my wife, my family, and my friends happy. Now that we’re debt free, I invest 50% of my paycheck automatically in the TSP, my IRAs, and my regular taxable account. You cannot achieve financial independence without income generating assets, whether it’s real estate, stocks, or bonds. You must have long term investments and not just cash sitting in a 0.1% APY bank account. After my long term investments, then I set aside a piece of my paycheck for lifestyle expenses. To figure out how much of each paycheck to set aside, I estimate how much I think my spending will be in a particular month based on my previous spending data. I usually spend $100/month on gas? Each paycheck I’ll set aside $50 in a separate “gas” savings account. Insurance and auto maintenance was $1200 last year? I’ll set aside $60 per paycheck ($1440/year) just in case it’s a bit higher this year. At the end of the year, I roll over any extra savings, invest them, or treat me and the wife for a night out. If I am off on my estimation for a particular month, I’ll bump it up next month so I do not get any surprises. 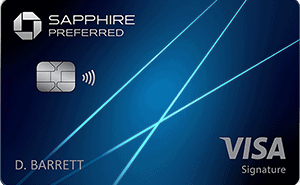 I try to put as many expenses as possible on my Chase Freedom and Chase Sapphire Preferred credit cards for the points. I have flown multiple times for free by using the points through Chase’s Ultimate Rewards program. Some people get real in depth into tracking their budget and keeping themselves on budget. If they can keep it that up, good for them. I find it to be boring and waste of time. There are much more productive things I can do with my life than figure out how I spent an extra $20 on gas last month. I stopped tracking our spending fastidiously around 2013. All of the automated tracking programs I tried required too much maintenance. I never keep receipts and don’t keep track of each individual transaction. Ain’t nobody got time for that! Rather than focusing on the pennies saved by budgeting tightly, I apply the Pareto principle and focus on cutting my big three expenses: housing, transportation, and food. Of all of our expense, these three represent 80% of our cost of living. By minimizing these expenses and investing 50% of my income into income producing assets, I can enjoy life and spend my leftover money how I choose. 2015 was an expensive year for us. We had a PCS from Washington state to the East coast and we sold our condo in Washington. We also finished paying off our remaining $37,000 in auto and student loans, using the profits from the sale of the condo. We maxed out all of our retirement accounts for the first year since graduating college plus put a little into our taxable brokerage account. For 2016, our monthly expenses should be lower than our last assignment and 2015 because we’re finally debt free. We’re planning on investing 50% of my income and all of my wife’s income. 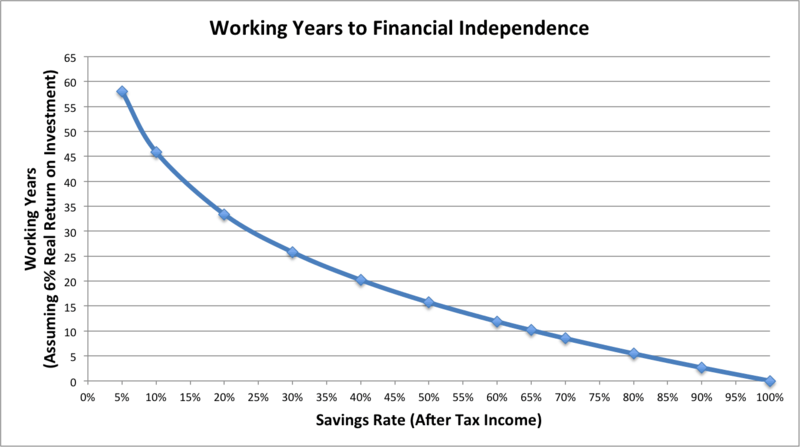 When you’re investing 50% of your income, you’re no more than 17 years away from financial independence (see chart above). We plan to be there before I turn 40. I never chase performance when I invest. I did this when I was in high school with predictable results: negative or negligible returns. Now I invest based on my investing principles: automatic, simple, diversified, and low cost investments are my preferred vehicles for growing my earnings into wealth. I do this with the TSP, Vanguard IRAs, and a Betterment taxable investment account and following my asset allocation plan. When I deploy for long enough I also pick up an SDP and keep that going for as long as I can. 50% of my base pay: $2,643/month, $18,000 per year. I should max out my Traditional TSP by August. If I’m lucky enough to deploy in the end of the year, I’ll make additional contributions towards the $53,000 combat zone cap. $11,000 per year, $1100/month. We reduced the size of our emergency fund this year and made the full contribution to my wife’s Traditional IRA in January. My Trad IRA should be maxed out by August. Read more on Traditional vs. Roth at the MadFientist. In my research, if you are paying any taxes in a year it makes sense to reduce your tax burden with a Traditional account. If you are an E-5 or below or O-1/O-2, then a Roth may make more sense depending on your spouse’s income. 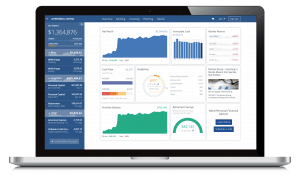 Once our tax advantaged retirement accounts are maximized for the year, we will make additional investments in our taxable investment accounts at Betterment and Vanguard. This should be around $3600/month from August onward. My plan this year is to get my Betterment account over $10,000 so the expense ratio will drop to 0.25%. After that, additional investments will be made in our Vanguard taxable account. My Betterment account is set to 90% stocks, 10% bonds and the rest of my 2016 asset allocation is described here. Our largest expense in 2016 will be the two bedroom house we’re renting at $1450/month ($17,400/year). Other than that, we expect to spend $400/month on groceries ($4800/year), and $300/month on going out, entertainment, drinks, dinner, etc. ($3600/year). Transportation thankfully drops to around $4800 for insurance, maintenance, and fuel. We really like our Mazda 3, but we are eyeing an upgrade to the Tesla 3 when it becomes widely available. Hopefully in 2020! Currently, our invested assets could replace about 10% of our monthly expenses using the 4% rule. However, I anticipate our monthly expenses to drop considerably when we become financially independent. For instance, our worldwide enabled T-Mobile cell phones, costing us $130/month, could easily be replaced by pay-as-you-go sim cards costing less than $50/month. Our housing costs should also drop, as we can be much more selective in where we live after my military service is complete. Estimating our post-FI lifestyle is a bit of guessing game, but I estimate that our invested assets could replace around 18% of our post-FI life. We’re getting there and are still on track for FI by age 40! Do you budget? Do you use a website to budget? Do you think we're being too lazy with regards to our budgeting or is not worrying about our expenses while we invest 50% of our income okay? Ben, you shacked it with those links. Those are exactly the articles that got me thinking about the Roth vs. Traditional debate more. My strategy now is if I’m paying any taxes in a year, I will contribute to the Traditional IRAs and TSP to lower my current year tax burden, invest those savings, and reap the benefit years down the line. If I receive the majority of my pay combat zone tax free (CZTE), then I will prioritize my Roth contributions. Next year I thought I would be deploying for 6 months CZTE, but now I may be going for a 2 year PCS to a different CZTE area. I will be writing an article explaining my strategy for maximizing my TSP contributions next year. Great job on your goal to becoming FI at 40. I only have one question. Can you touch your TSP money before the age of 59.5? I would think that if you wanted to be FI by 40, you would have more money in taxable accounts since you can access that money freely. I ask this because I am in the same dilemma. I’m trying to figure out if I should maximize my TSP or just invest in a taxable account since I want to be able to reach FI before 59.5. I was thinking of just contributing enough to stay at 15% tax bracket and the rest into Betterment or Vanguard. What are your thought? There are many ways of accessing tax advantaged money before the 59.5 cutoff. The Madfientist detailed a few of these strategies. Personally, I’m taking advantage of all the tax advantaged accounts I can and investing the tax savings today for better future returns. While I plan on being financially independent by age 40, I don’t plan on cutting off all of my income sources. I don’t know the exact mixture of tax advantaged and regular investment accounts to have at this time, but when I do I will write a post about it! Hi, I thought I read somewhere that being in the military counts as having a pension (even if you don’t go the full 20) and so you lose the pre tax benefits of a traditional IRA. If this is the case wouldn’t you want to go Roth? Thanks! Not sure where you’re getting this information, but unless you serve 20 years you will not see a pension.